Swiss Re delivered a Group net income of USD 331 million, supported by a continued solid underwriting performance and a strong investment result. Global growth improved in 2017. Long-term bond yields remained low while equity markets rallied. Global growth improved in 2017, while inflation remained moderate. Long-term bond yields remained low despite a reduction of monetary stimulus by some of the major central banks. Stock markets performed well in this environment. The US economy, after a weak first quarter, returned to robust growth in the third quarter of 2017, despite disruptions caused by hurricanes Harvey and Irma. The Euro area economy outperformed expectations and accelerated significantly compared to 2016. The pick-up in growth was broadly based across Euro area member countries. Nevertheless, the level of real economic output has still not recovered to pre-global-financial-crisis levels in a number of countries, including Greece, Italy and Portugal. Growth in the United Kingdom was weaker than in the Euro area as Brexit-related uncertainty hampered business investment. Elevated inflation in the United Kingdom eroded consumer purchasing power and thus spending. The Japanese economy outperformed expectations in the first half of 2017, driven mainly by a recovery in exports. Headline inflation continued to increase in the major markets, driven by the price of oil, which was higher on average in 2017 compared to 2016. However, underlying inflation (excluding energy prices) as well as wage increases remained moderate despite broad-based declines in unemployment. In the US, wage gains decelerated to about 2.5% year on year in 2017, down from 2.9% in December 2016. Similarly, wage growth in the UK slowed in 2017 compared to 2016, despite record low unemployment. Economic performance in emerging markets varied. GDP growth in emerging Asia remained strong. China's economy continued to grow at a rapid pace, despite increasing government efforts to de-risk the financial sector and reduce excess industrial capacity. Growth in India slowed in 2017, likely due to the government's demonetisation programme initiated in November 2016. Growth in the Middle East also slowed, mainly driven by a contraction in Saudi Arabia and a slowdown in UAE and Iran. In Central and Eastern Europe (CEE), the economic expansion accelerated significantly in 2017, driven primarily by CEE EU-member countries, although the Russian economy also expanded after having contracted in the previous two years. Overall, economic growth in Africa improved in 2017, but varied significantly by region. Growth in the commodity-intensive countries in sub-Saharan Africa benefited from stronger commodity prices. While South Africa, Nigeria and Angola emerged from recession, economic recovery has been weak. Non-commodity intensive markets continued to deliver solid-to-strong growth based on infrastructure investments. Latin America's aggregate real GDP growth also improved in 2017 as Brazil and Argentina returned to growth. The expansion in the region, however, remained modest overall. Some of the major central banks reduced their monetary stimulus measures in 2017. The US Federal Reserve (Fed), which had already increased interest rates in late 2015 and 2016 by 25 basis points each, raised interest rates three more times in 2017. In addition, the Fed stopped reinvesting some of the maturing debt securities as of October 2017, which will lead to a gradual reduction of its balance sheet. The Bank of England raised interest rates for the first time in over a decade in November 2017, reversing the post-Brexit vote emergency cut. In October, the European Central Bank (ECB) announced an extension of its monthly asset purchases until September 2018 or beyond, while stating that it planned to reduce the volume of monthly purchases in half as of January 2018. Despite these adjustments, central bank monetary policies in advanced markets remain very loose overall. Low levels of inflation provided scope for monetary policy easing in a number of emerging markets, including Brazil, Russia and India. Despite initial moves towards less accommodative monetary policies in some advanced markets and stronger growth, long-term government bond yields were broadly unchanged on the year (see interest rates chart). The US 10-year yield ended the year at 2.4%, the UK yield at 1.2% and the Japanese yield at 0%. The yield on the German 10-year government bond was up modestly and ended the year at 0.4%, compared to 0.2% at the end of 2016. 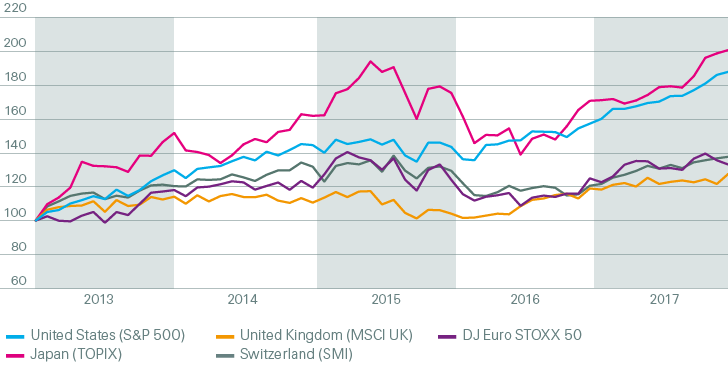 Stronger growth, moderate inflation and continued support from central banks supported stock markets in 2017 (see stock markets chart). The US S&P 500 gained 19%, the Japanese TOPIX 18% and the Swiss Market Index 14%. The Eurostoxx50 and the MSCI UK increased by a more moderate 6% and 7%, respectively. The US dollar weakened versus other major currencies during 2017. The election of Donald Trump in November 2016 had raised expectations of stronger growth, higher inflation and higher interest rates, which caused the US dollar to appreciate in late 2016. During the course of 2017, expectations of increased US public spending and tax cuts were scaled back, causing the US dollar to weaken again. The British pound was up 10% versus the US dollar in 2017, and the euro gained 14%, helped by stronger than expected growth in the Euro area. The Japanese yen and the Swiss franc were up by a more moderate 4% and 5% versus the US dollar, respectively. The latter two currencies are typically perceived as “safe havens” and became relatively less attractive as economic confidence improved. There are both upside opportunities and downside risks to the economic outlook. China stepped up efforts to deleverage corporate debt in 2017. This has helped contain, but not resolve, the problem of lingering credit risks in China. The risk of protectionism has increased under the current US administration. This could result in a global trade war that has the potential to harm growth on a global scale. There are also worries about the impact that the scaling back of central banks' “quantitative easing” measures will have on markets. However, central banks have been very diligent so far in communicating their plans and have adopted a gradual approach that is likely to mitigate this risk. Nevertheless, this risk could become more significant in a rising inflation environment. Political risks in Europe that dominated the headlines in early 2017 (eg, elections in France and the Netherlands) have lessened, although the risk of a disorderly Brexit arguably increased during 2017 given the slow progress in the Brexit negotiations. In addition, geopolitical risks (North Korea, Middle East, etc.) remain elevated, but their economic consequences are hard to quantify. These risks would affect re/insurers mainly via adverse asset price movements and slower growth potential in affected markets. In addition, a “flight to quality” could lead to a drop in interest rates and exacerbate the challenges from the persistent low yield environment. Upside opportunities could result in stronger growth and would be beneficial for the re/insurance industry. Investment yields would improve, albeit only slowly, and premium volumes would rise along with economic activity. However, inflation may increase along with stronger growth. Should inflation remain elevated over several years, this could have a sizeable impact on re/insurance claims, especially in casualty lines. One key upside risk comes from US fiscal policy. The tax bill passed in late 2017 included more front-loaded benefits than earlier drafts. A resulting fiscal boost is expected to add modestly to growth in 2018 and 2019. If those benefitting from the tax cut spend a larger proportion of the windfall than currently expected, growth could turn out to be even stronger. Other upside risks include stronger performance in the Euro area as the cyclical upswing may prove to be more robust than expected, and a resilient UK economy if Brexit is less damaging than predicted. Finally, China could maintain growth of near 7% rather than slow gradually, benefiting Asia overall and global commodity exporters in particular.